The results of the study, released to mark National Eczema Week (17th – 25th September), follow on from a survey of 1,000 British parents, which looked to discover if they were managing their child’s eczema effectively. The results reveal that the average parent uses 10.8 litres of emollients every year – accumulating to 65 litres over the course of their child’s eczema – enough to paint and re-paint an entire 2 bedroom/1 bathroom house with emollient. Despite this, a leading eczema expert believes that even larger amounts are necessary for effective treatment. Paediatric Dermatology Nurse Karen Pett said: “When it comes to eczema, the old adage ‘prevention is better than cure’ is true. “Parents should aim to keep their child’s skin soft and supple with generous use of emollients, applying multiple times a day. This will prevent your child from suffering itchy flare ups and reduce the need to use stronger steroid based creams. Only 16% of parents apply emollients multiple times a day, the frequency recommended by the National Eczema Society who advise application should be ‘liberal and frequent’. Most UK parents (91%) apply emollient to their child’s skin once a day. However application techniques varied, with more than 1 in 4 parents applying emollient incorrectly, either by rubbing on and working it in until the skin feels dry or just dabbing a small amount on to flare ups. Correct application, as recommended by the National Eczema Society, is to massage in lightly, leaving the skin damp. Dealing with the physical symptoms isn’t the only challenge that parents face with eczema. The survey also revealed the emotional effects that eczema can have on day to day life for their child. Three quarters of parents said they don’t feel very confident about looking after their child’s eczema and 94% of parents had sought further advice on managing eczema. Health and parenting forums ranked as the most commonly used online resource (58%), more common than visiting a GP for advice (52%). Around the same number reported they use the NHS Choices website (50%) for eczema guidance. 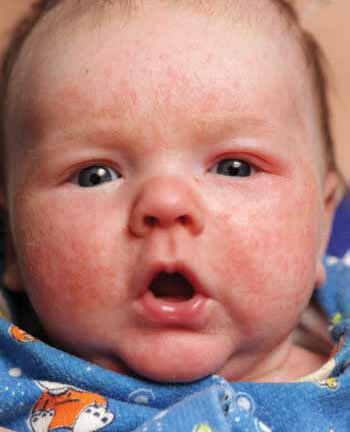 The majority of parents (57%) of parents wish they had more information on how to look after their child’s eczema. The topics which parents said would be most useful were: information on emollient application (38%), bath-time advice (37%) and tips for talking to their child about their eczema (33%).